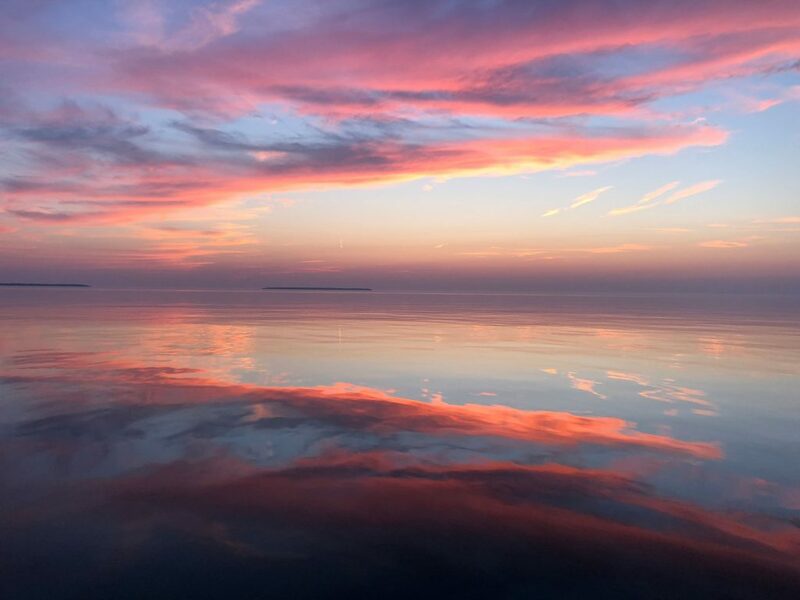 I have frequently described the North Channel area of Lake Huron as wilderness sailing dotted with a few quirky towns. 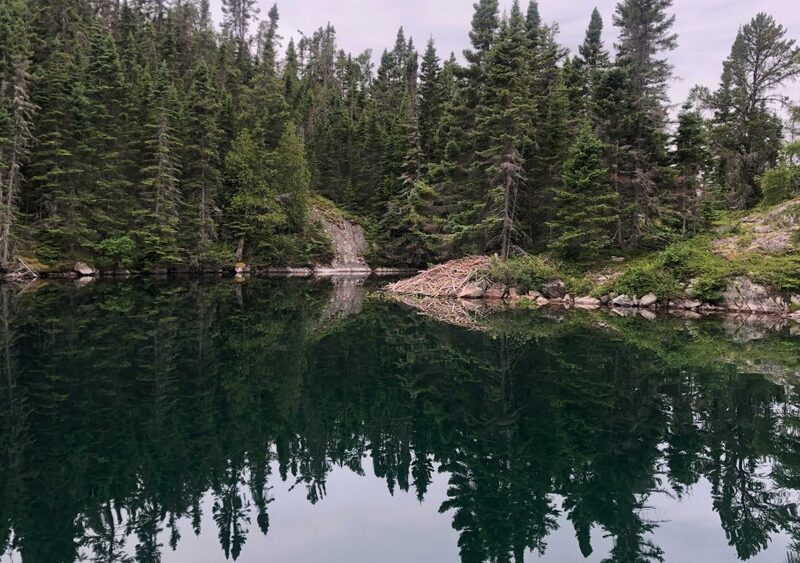 For the Canadian side of Lake Superior, I would describe it as extreme wilderness sailing accented with “colorful locals.” Now I hope that none of our Canadian friends (new and old) will take offense to this description. They should wear it as a badge of honour as being “colorful” is far better than being dull or non-descript. On our most recent travels, we once again caught up with our friends from Batchawana Bay (just north of Sault Sainte Marie). Dave and Margaret sail on Steele’nTime, a very well equipped Beneteau 40. 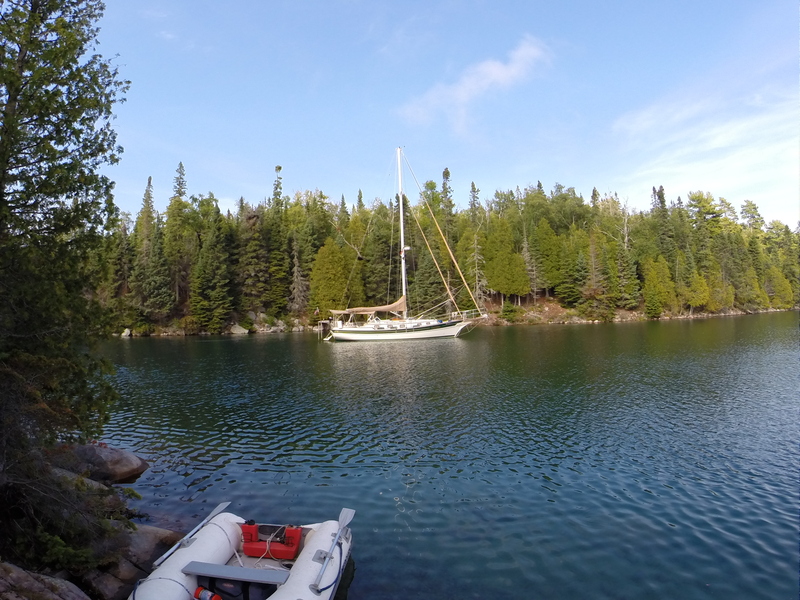 They have provided us with an abundance of local knowledge regarding sailing the remote areas of eastern Lake Superior. It is their backyard. Steele’nTime had plans to depart Batchawana Bay for a week of sailing starting on July 14 with a couple of other boats. Our plan was to arrive in Batchawana Bay early afternoon on Friday July 13. We hoped to sail with the group for a day or two. That was the plan. However, Pino’s grocery store in the Soo delayed our departure until much later than we planned. For our Minnesota friends, Pino’s is an Italian equivalent to Lund’s & Byerly’s. It’s huge with an amazing selection of fresh produce, meats, and sausages. We got underway at 3:45pm and headed through the Canadian locks. I hate those locks! You would think after doing the entire Erie Canal that one lock would be a piece of cake. Nope. Our first experience going west through the lock was in 2015. There was lots of turbulence in the lock, cross-winds, and a big tour boat all in the mix. We were the unscheduled entertainment. We did a bit better this time but still managed to drop a boathook into the drink. And this time we were wearing headsets so my sailor-style swearing was heard only by Dan. It’s a good thing one of us has the ability to stay calm. Shortly out of the Soo, we started seeing some coolant dripping into the engine pan. We pulled out of the shipping channel while Dan investigated the situation. An hour later, we proceeded on hoping that we might stop in a bay further north. Consulting with our “local” experts, the advice was to continue to Batchawana. Our ETA was 11:30pm. Anchoring in the dark was going to be a first for us. Fortunately, we had been in the bay before so we had some idea of where we were. Emphasis on the word “some”. 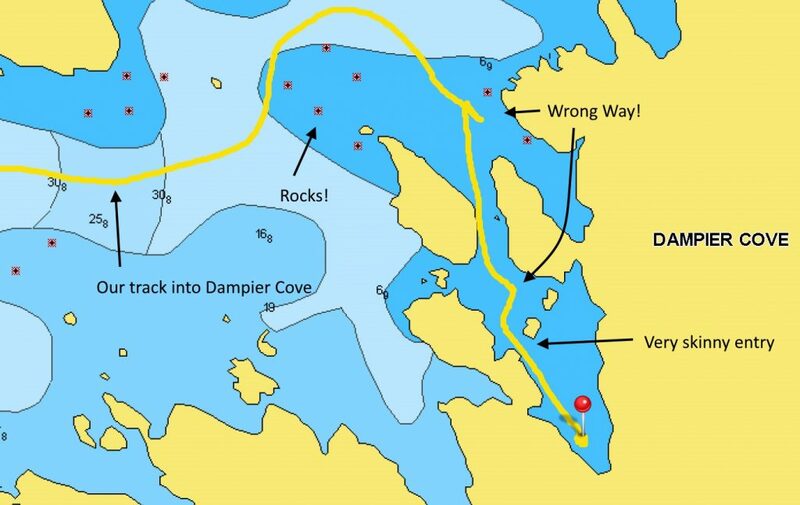 We reduced our speed to a crawl as we meandered through the shallow areas and dropped our anchor in the bay. It wasn’t until morning that we realized our position was quite far from the small marina entrance that we had been targeting and much closer to the lake homes along the shore. she’s a bit too long on one end or the other. We also met a friend of theirs who runs a second-hand store in the Soo – another colorful local and great connection for the future! I’ll call him Uncle Paul, as that is what Margaret calls him. In her opinion “everyone needs an Uncle Paul!” And now we have an Uncle Paul as well who offered us transportation the next time we’re in the Soo and help finding everything/anything we might need. 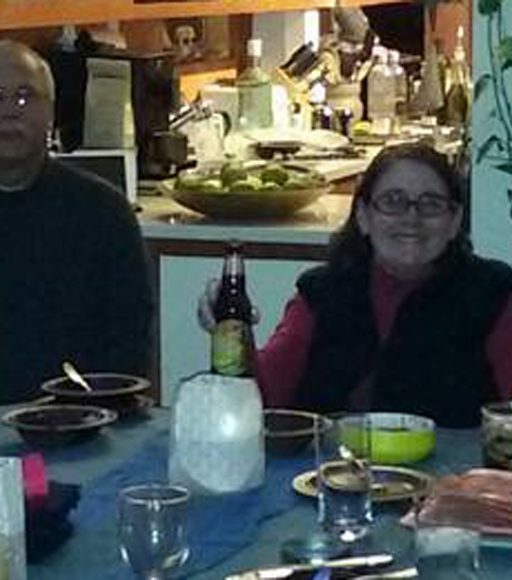 With satisfied bellies, we headed to our respective boats and northward. As it turns out, the other boats that had planned to travel north had backed out. Our target destination was Gargantua Bay, a mere 57nm up the coast. The trip took the better part of ten hours, longer than expected due to some issues we encountered along the way. On one of my trips below decks, I noticed a rotten egg smell. Initially Dan thought it was a wrapper from fish that had been tossed in the garbage. But then my throat started getting sore. Missing the first clue regarding the smell, it was 3:00pm when we realized our battery bank was “cooking” and giving off Sulphur gases. We quickly shut everything off – everything. We were now drifting between some fish nets and some shoals. Steele’nTime had disappeared into a fog bank ahead of us and we hailed advising them of our situation. We turned off the switch to the house battery bank to isolate the engine battery. With that we fired up the engine and continued on using our iPad for navigation. In the fog. With no radar or VHF (somehow our handhelds did not make it back onto the boat in the Spring.) We were in deep water and could see just far enough to ensure that we didn’t run over a fish marker. As we got closer to Gargantua, we saw a glimpse of Steele’nTime as they turned into the entrance of the bay area. And then another thick fog bank rolled in. Fortunately for us, Dave and Margaret realized we might have some difficulty finding our way in and waited to guide us in. Without our big house battery bank, use of our anchor windlass was out of the question. 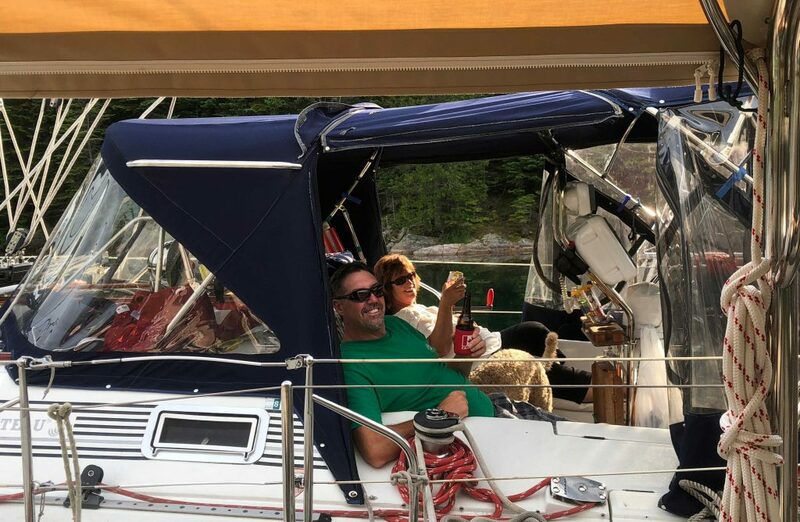 Being in Canadian waters, we did what all good Canadian boaters do – we rafted up. In fact, Dave already had his fenders and docklines ready for us. It’s a Canadian thing. Rafting. After checking everything possible with the house batteries and adding additional liquid to replace what had cooked/steamed off the prior day we decided to continue on. It was short run to our next stop and we figured it would be a way to “test” the system. We still really had no idea what caused the issue the day before. Tugboat Channel is a very narrow passageway between a line of islands/shoals and the mainland. It is much safer to go on the outside but we were with Dave. And Dave always takes the channel because, well because he can. 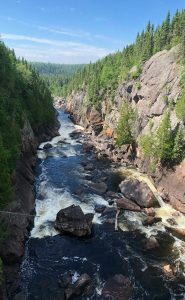 Along this channel you pass interesting places such as Devil’s Warehouse where the ochre color was obtained for the pictographs at Agawa. And a bit further is the Devil’s Chair, which in recent years has given way to Mother Superior. 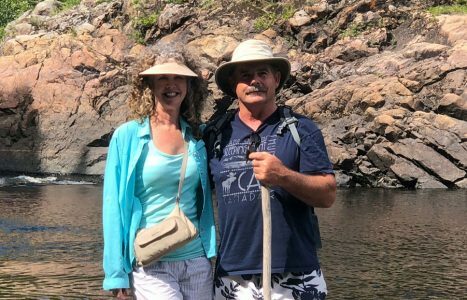 We continued on with stops at a couple of other lovely spots before we reached our favorite spot – Old Dave’s Harbour. We contend that it is really named after Dave as he has visited so many times he could be considered a regular. The log books are filled with comments made by his daughters when they were young. 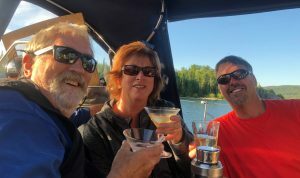 After a couple of nights experimenting with Smoking Vodka Martini’s and various Manhattan’s, Dave and Margaret sailed off to Michipicoten Island. For our part, we did the hike to the lighthouse and found the blueberries just starting to ripen. Dampier Cove is an anchorage not far from Old Dave’s and we had attempted to go there in 2015. The entrance is tricky and we opted to go around the corner into Nicol’s Cove. We were determined to make it in this time and left Old Dave’s early to ensure that we would have good overhead light as we entered the Oiseau Bay (pronounced wazoo) area. Dave and Margaret had given us some tips although he wasn’t quite sure what side of a small island you should go around. I arbitrarily picked one side. Dan, who was on bow watch, quickly informed me that I was heading into shoals and we backed up and went the other side. From my view at the helm, I could see huge shoals coming up on either side of the boat. But we maintained 8 feet of water through the very, very narrow slot. Once safely passed the entry barricade, we found ourselves in the most picturesque little bay. 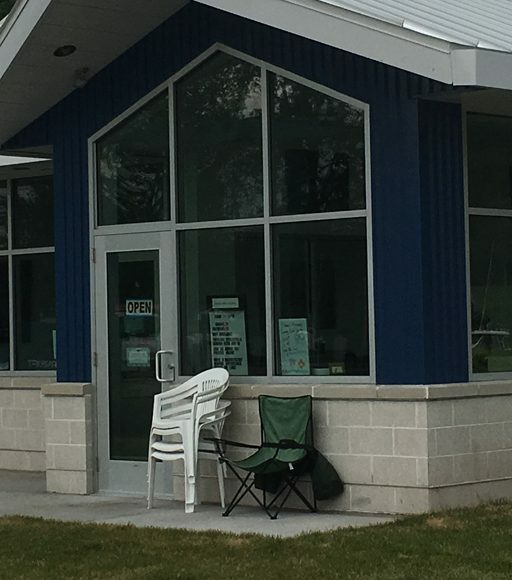 Completely protected from the winds and wave action out on the lake. The cove was so perfect that we stayed three nights! On our second day in Dampier Cove a trawler named Sandy Gal II arrived. Shortly after dropping anchor, they puttered over in their dinghy to introduce themselves. Nick and Rachel from Thunder Bay. They were completing the Great Loop (a circle tour that encompasses Chicago, the Mississippi, across the Gulf, north up the Eastern shore of the U.S. and up the Hudson River back into the Great Lakes). We invited them for Boat Rules Happy Hour and had a lovely evening stories of our respective wanderings. Sandy Gal has a very unique method of wandering. They go in and out of every single little bay which means they travel about four times further than anyone else going from point A to point B. Rachel is an artist and I suspect she never learned to color within the lines! Both boats were heading north targeting Pulpwood Harbour. Along the way we did a day stop in Playter Harbour and left Gaviidae behind as we joined them on a trip up the White River. We went all the way back to the falls where Nick dropped anchor. They wanted us to see the suspension bridge over the gorge. It was a lovely hike and the bridge over roaring gorge was amazing. And a little unnerving looking down on the rapids below. Lots of pictures were taken and I tried my best to get Nick to smile. Instead he would deadpan at the camera and insisted that the picture be titled “colorful locals”. So, Nick – you have your wish! After a stop in the Slate Islands, we had pushed our systems as far as they could go. We had emptied two of our three water tanks and our holding tank was on the verge of exploding. With that, we headed into Rossport, ON. 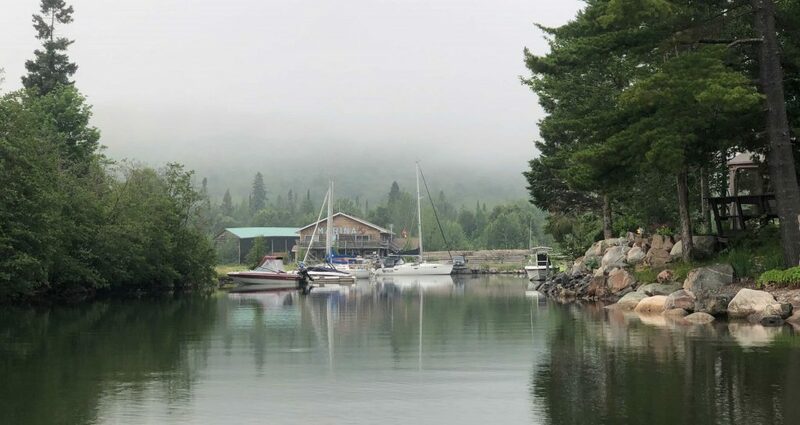 Our first dock/marina in fifteen days of wilderness sailing. As we were leaving the Slates and picking up the first cell signal in the same amount of time, I got a text message from my sister Lynne. She and her husband Jim were returning from the Artic Circle and were north of Thunder Bay. They knew we were “somewhere” in the area and wanted to connect. As it turns out, Rossport ON was the crossroads. Rossport is tiny. No stores. One restaurant. Fortunately, the Serendipity Gardens Café is wonderful. So wonderful that reservations are recommended even during the middle of the week! 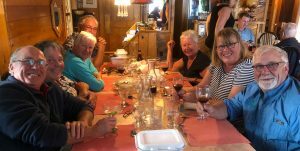 While we were having our little family reunion, the Wray family of Thunder Bay fame was also holding court. We had run into Dave and Colleen along the Erie Canal last summer. Small world. And they’re good friends with Nick and Rachel from Sandy Gal. Smaller world. And colorful. And Canadian. Colorful Locals! Thank you, Julie!! So love your stories! Quite some summer you guys have had. :-) Hope all systems are now in complete working order. We are just finishing off the last week in Southern Georgian Bay before back to our ‘regular’ lives. I hope that your weather has been as spectacular as ours has been….despite the thunderstorms(I think we got the the same weather system!!) Winds gusting to 40 kns. We were in Covered Portage Cove and well anchored……but two boats ahead of us dragged down onto us. Jerry spent most of the storm in the dinghy helping the captains re-anchor!! Sailors helping sailors. moon Shadow (Wray’s)Enjoyed seeing you in Rossport!